Okay, so I'm now a twin owner and I love it but there's been a lot of great twins. What's your favourite? Spent a great day getting sunburned at Wanganui watching the bike racing. The day started off with a great ride through Halcombe, Martin and the Turakina valley before joining the throngs heading for the Cemetery Circuit. Watched some great racing and had a lot of fun trying to get some decent photos. Great to see the the Britten out on the track even if it was just idling around the course. Particularly enjoyed the motards and the classic side cars - plenty of action there. A great way to spend Boxing Day! I've been looking at GPS units for a while now and initially wasn't going to go the whole Zumo hog due to the cost. I priced up other units and waterproof mounting options etc but then a Zumo came up for sale on Kiwi Biker at a good price - about the same as the other options + mounts that I'd been looking at. I couldn't pass it up and so here it is. At the moment I'm using the handle bar mount which came with the unit and which is supposed to be on the left hand side but as my heated grips controller is there then they had to go on the right hand side. It's not in too bad a position and is not quite as "in your face" as it looks in the pictures - when riding you have to look down to see the screen. I still think that I'll end up with a different mount more centrally located to get it more out of the way. 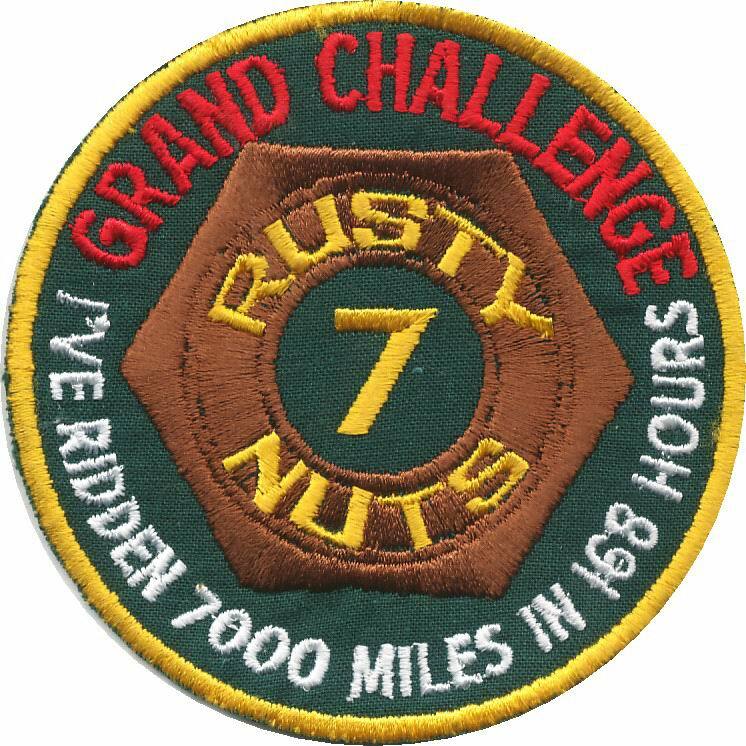 I'm really looking forward to putting it to the test on a decent ride (next year's Southern Cross for one) and it should be great for rides like the Grand Challenge. I hadn't planned on getting to tonight's Friday night ride as there was Xmas shopping to be done but in the end I managed to knock that out pretty quickly. After a quick feed I decided to get the Honda out and head off to see if I could catch up with everyone. They had a one and a half hour head start and I had no idea where they were going so the chances of actually catching them were reasonably slim but I did know where they were intending on finishing up. 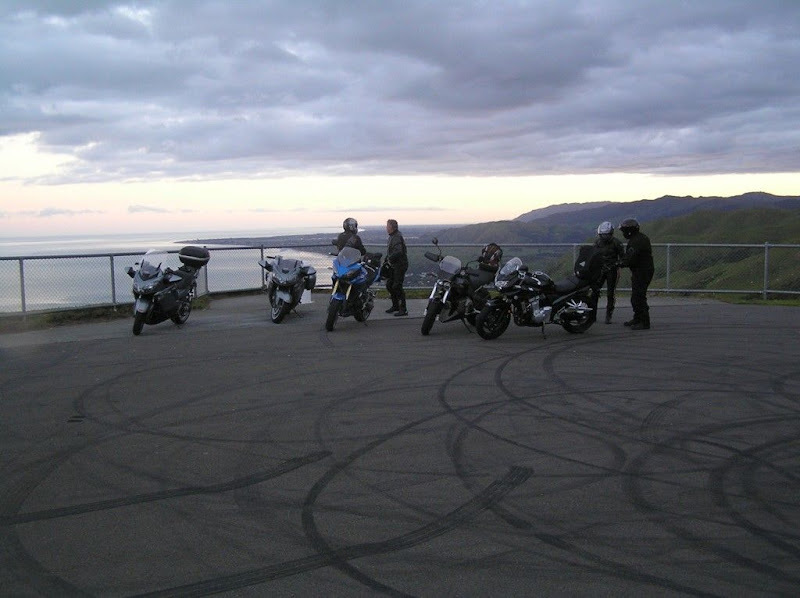 As it was only just after 7:30pm, I figured that they would still be riding rather than parked up at the Ashhurst Cafe so I decided to hit the track, run through Balance and then the gorge before trying the Cafe. I had a great ride over the track and through Balance but when I rolled into Ashhurst there was still no sign of them so I headed for town to check out a couple of other possible spots where they may have stopped instead. On the way into town I only saw one other bike and it was a certain green Kwaka heading home - nobody else in tow. After a quick lap around town checking out a few watering holes I finally gave up and headed home. A nice little ride to wind up the week and probably the only chance I'll get to go out on the bike this side of Christmas. I'm afraid to say it but it was another nice day today and although I was not sure that the Wanganui Toy run was on or not, I decided to head over and see for myself. After pottering over on the Honda and topping up the tank, I headed to the racecourse to see what was happening. When I turned up there was probably only a dozen bikes there and I still wasn't sure if this meant that the ride was on or not. I quick word to a Ulyssian soon had that sorted out so I deposited my toy and grabbed a drink & Bar-bee lunch before quickly buying a badge before they all sold out. After hanging around waiting for about an hour there was finally probably over 100 bikes and Santa led us through town on his trusty Beemer (he always seems to ride a BM??) and on out of town. At Turakina we turned inland more and headed on towards Marton. It's a great ride through here and Santa kept up quite a good pace - nice to see that he appreciates a corner or two. Once in Marton the ride was due to stop for refreshments but I decided to carry on and came home via Halcombe and Mount Stewart. Another great ride to make a total of three for the weekend - it must be summer! Yesterday was the annual Coast to Coast run to raise money for the local rescue helicopter and for a nice change the weather decided to play ball guaranteeing a good turn-out. Mark and I headed out to Himatangi at around 9 and joined up with a lot of bikers along the way. Parking up at Himatangi we soon ran into Brian, Horse and a few others while we registered and milled around waiting for a start. While registering a certain red Connie also turned up and parked next to me. Leaving Himatangi we took the boring route up to Sanson and then into Fielding where we stopped so that Mark could top up the Bandit before heading on to Ashhurst, the Saddle and into Woodville for lunch. Along the straights past Colyton we had our first experience with the usual idiots that like to come out for the ride and have to pass everyone else regardless of any safety concerns. Coming into Woodville was a very slow process as all the bikes had bunched up and were crawling - I even got stuck behind my old K6 Bandit, 2-up with a couple of mods since I traded it. It was here that I noticed that my temperature gauge was getting a fair bit higher than normal and I couldn't hear the fan (thought it was because of all the other bike noise). When I pointed it out to Mark he looked down and said that he could see that the fan was not turning. No sooner had he said that the high temp warning came up on the bike's screen. I quickly got out of the traffic, went up a side street and parked the bike with a fair bit of worry kicking in. Once stopped I pulled the seat off and started looking for fuses, hoping that this would be the cause of my problems. I found the correct fuse but had a bit of trouble getting it out. Luckily the old man had popped down from Napier to check out the ride and he was able to pull it and confirm that the fuse was toast. We replaced it with one of the spares and hey presto the fan was back in action. After this wee drama we grabbed our lunch and then snuck out of Woodville a bit early to stay clear of the main bunch of bikes. We had a fantastic ride over to the beach as the roads were dry and in better than normal condition. We passed a few slower riders and got to Akito before the big rush for cold drinks and a bit of a breather. Not long after we stopped the rest of the bikes started rolling in and it was entertaining checking out all the different breeds (bikes & bikers) that turn up for the ride. There was even a picture of our bike's (parked up in the pouring rain) from the 2007 ride stuck to the shop window. One of the organisers mentioned that there was over 500 bikes so a pretty good effort and plenty of money raised for the helicopter. Mark, Brian and I flagged the prize giving as we had to be back in Palmy and had a great ride back through Weber & Danniverke only stopping at Woodville to gas up the Connies before arriving home at around 5pm. A great day out riding and my 8th Coast to Coast badge to add to the collection. After getting the VTR back yesterday it would have been rude not to do the Friday night ride - the first one in about three weeks! Parking up at Ashhurst to wait for kick-off I had the chance to meet a few people I hadn't seen on the rides before and it wasn't long before quite a selection of bikes had arrived and the route was planned out. We ended up heading through the gorge (a nice run with no traffic to hold us up), through Balance, out through Mangamire and back into Pahiatua for a drink. The weather was absolutely perfect and even the low sun was not too much of a problem. Following the drinks break most people went their separate ways and I followed Sam (SV1000) back over the track and into Palmy. He set a nice comfortable pace and it was a really nice ride back into town. Great to have the Honda back and some great weather for riding! Yep, all fixed up. Had to get a different screen as the previous Givi one was unavailable - hope the new one is as good as it was. Everything else looks good and I can't wait to go for a decent ride on her! Life may begin at 30, but it doesn't get real interesting until about 60mph. Saddlebags can never hold everything you want, but they they can hold everything you need. Riding faster than everyone else only guarantees you will ride alone. Never hesitate to ride past the last streetlight at the edge of town. Never do less than 40 miles before breakfast. Two lane Blacktop isn't a highway; it's an attitude. When you look down the road it seems never to end, but you better believe it does. People are like motorcycles; each is customized differently. A friend is someone who'll get out of bed at 2:00AM to drive his pickup to the middle of nowhere to get you when you are broken down. Catching a yellow-jacket in your shirt at 70mph can double your vocabulary. There is something ugly about a new bike on a trailer. Don't argue with an 18 wheeler, a bus or even a car. If you can't get it going with bungee cords,wire and electrician's tape it's serious. If you ride like there is no tomorrow, there won't be. Bikes parked out front mean good chicken fried steak inside. There are old riders.There are bold riders. There are no old bold riders. Patience is the ability to keep your engine idling. Gray haired riders didn't get that way from pure luck. Just spotted the below link regarding a new recall for the Connie. It refers to road debries etc building up around the rear brake pedal and interferring with the operation of the brake pedal. Doesn't look like a major as there's not even a remedy yet - best check it out at some stage. Yep, it's that time of year so there's Toy runs to ride. Today was the Palmerston North one organised by the CDMTC - they also organised a very hot & sunny day. I met up with a few of the usual Friday night ride crew and headed over to Fielding where the ride started from. We parked up, got badges and waited for the arrival of Santa on his Honda (Rudolph was riding pillion). 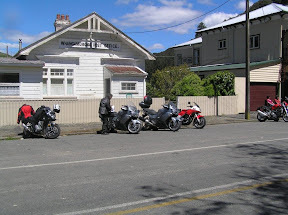 The ride was a simple one through to Halcombe, back in behind Fielding, across to Ashhurst and finally ending up at the Awapuni Hotel where toys were donated, sausages eaten and drinks drunk. The next one is the Wellington one tomorrow - don't know if I'll be doing it just yet but it looks like they should definitely have good weather for it. Another cracker of a day and though I was supposed to be thinking about heading into town for some Christmas shopping, Sarge had posted a suggestion for a ride in the afternoon and it was just too hard to pass up. I met up with Sarge and the others at Ashhurst and after a bit of chin wagging we headed off over towards Colyton, Cheltenham and finally Vinegar Hill. The road was in good nick with just the odd bit of hot tar to look out for. Once we got back to SH1 we stopped for a bit of a natter before turning around and doing it all again but in the opposite direction. This time though we stopped in at Cheltenham for a cold drink and some more yarning before finally heading for home. On the way back Sarge & I swapped bikes (he'd been hassling AFC for a demo ride and hadn't managed to swing it) so I got to sample the FZ-1 on the way into town. And what an angry little beast it is! A very willing and snarling engine in a very tight package. Very easy to ride with it's great riding position and wide bars. Even the little screen was surprisingly effective at deflecting the wind. Great fun! Yep, another absolute cracker of a day out there - should be out on my bike, wait a minute, I just got back from an awesome ride. I wasn't actually planning on riding today as I've got stuff to do around home but Brian rang me at about 20 to 11 and said he & Chris were heading down to Masterton at about 11 and would I be keen? Well, I sorted myself out and headed off around to Brian's. I got there just after 11 and saw that the house was all shut off - damn, I've missed them. So I took off, got some gas and headed off over the track and then around to Mangamire - taking the route that Brian had mentioned on the phone. Never saw or caught them up so I kept on going quietly down to Masterton. When I got there I did about 3 laps of the town looking out for them before I had to stop for a cold drink (hot work today) and some lunch. After my break I headed on out onto Route 52 through to Alfredton, Pahiatua and them home. To say that this was a great ride through here is a massive understatement! The weather was fantastic, great scenery, the roads in good condition and absolute joy to ride. It was just one of those great rides! So good that I never got around to stopping for any pictures so you'll have to make do with some of a bug-splattered bike & helmet (helmet clean before I left). Yep, summer's here alright! Finally got into Te Manawa to check out the "Motorcycles Unleashed" exhibit. Had some fantastic bikes in there - it's always great to see a Britten in the flesh, shame it was stationary. A couple of the guys tried the racing simulator which was actually quite good though it proved to be trickier than it looked when it came to actually riding the thing. Friday was the last official day of my baby leave so I took the opportunity to make use of the good weather and head out for a ride. It was Daves day off as well and he was keen for a bit of riding. Dave had worked night shift the night before so we had the gentlemenly start time of 11am. Leaving Ashurst we headed throught the gorge and south to Pahiatua. Here we took to the back roads continuing south towards Masterton. About 15mins out of Masterton we came accross a young girl that had just crashed her car. On a straight bit of road she had managed to hit the bank on the wrong side and the car ended up on it's side in the ditch. She was a bit dazed and had a couple of minor cuts. We checked her out and waited for help to arrive before continuing on to Castlepoint. We made it to the coast just after 1pm where we had a late lunch before attacking the great bit of road that would take us back to Masterton again. 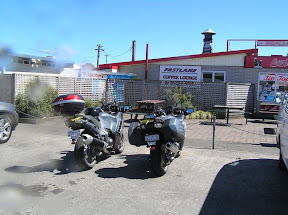 We stopped for a quick fuel up the back to Ashurst via Mangamire and the Pahaitua track, arriving just before 4pm. Other that having to deal with the car accident it was a good day out with warm fine weather and some good roads to ride on. Tonight's route was a quick squirt over the saddle, through Balance, and onto Mangamire before heading back over the track into Ashhurst for drinkees & snacks. As mentioned before the weather was perfect although the low sun was a bit of a pain at times. The bugs were out in force too. All in all it was a great ride with about a dozen or so bikes and a great way to wind up the working week. After some pressure from Andrew I have finally got the folks to take a decent photo of me so thought I had better introduce myself to the world properly. 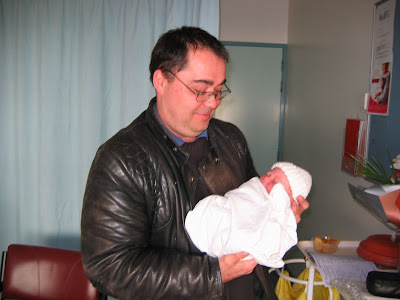 Geez, the old man writes up a blog about his first ride after my birth but can't even be bothered posting a picture of me for the world to see. Well, I'll just have to do it myself. That's me, the one all bundled up checking out Andrew's leather jacket. 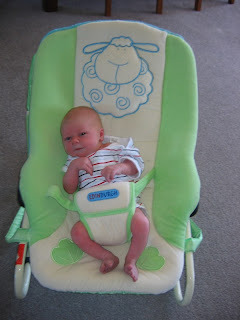 (I decided to post this pic seeing as I'm still upset at Dad and cause Andrew let me do this blog). It was a week since Connor had been born and the little dude was telling me that I needed to go for a ride to celebrate his one week birthday. Since the sun was out and all was good on the home front I took up the challenge. I headed out of Palmy over the Pahiatua Track, through some very sorft tar going down the other side then out through Mangamaire. Once I was back on Highway 2 I truned towards Masterton but a couple of k's down the road I turned left and out onto the back roads that would eventually take me back to Pahiatua. Then I followed the main roads back through the gorge and home. Only a short run but I got some fresh air and blew out a few cobwebs. On another note I purchased some Oxford heated handlebar grips on Trademe and they turned up in the mail. Shouldn't need them for the summer but they will be on before the Southern Cross next year. I must be getting soft! 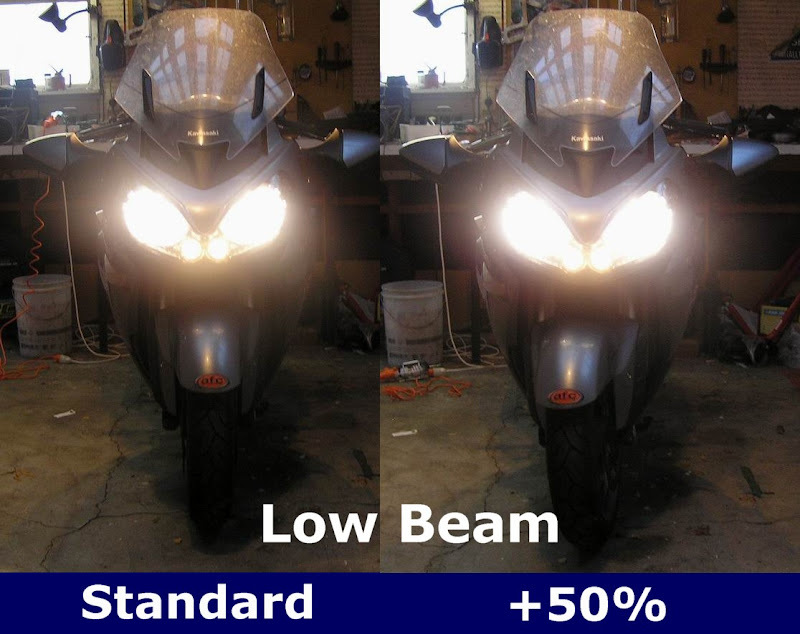 Saw an item on TV and then the below on the web about LTNZ thinking of making lights-on compulsory in New Zealand to help other motorists see bikes better and avoid hitting them. I'm not really for or against the idea (and both my bikes give me no option - the lights are already hard-wired on) - but generally prefer people to be free to make up there own mind on things like this. No amount of rules & regulations will stop stupid people from doing stupid things - be the master of your own destiny and do not trust anyone else on the road! Our local museum is currently showing an exhibit featuring a huge range of racing motorcycles. Top of the list to see are the Kiwi-built bikes: the mighty Britten, the Buckley 500GP bikes, McIntosh Suzuki's etc. It's on for quite a while and the displays are going to change every now and again so it could well be worth more than one visit. Got the good news today that the VTR is going to be fixed - I didn't really want to see her written off as she hasn't got a lot of k's on the clocks and is in good nick. The repair quote came to $6,800 but the shop valued the bike at $9-9,500 so I just snuck in. Looks like the little Bandit is in for some changes next year. Haven't heard anything about changes to the 1250 - yet. Looks like a few changes to the front of the fairing (wish there was a bigger piccy), quite nice. Strangely enough the weekend yielded two fine days in a row and just as I was contemplating firing up the mower, Brian rang to tell me we were going on the CDMTC Interclub ride. I had all of about quarter of an hour to wolf down some lunch and get my act together before he turned up and we headed off to meet up with the rest of the group. Once at the launching point we ran into a few people we knew including the guy that used to own my VTR (Brian knew him) and Robin, another Connie rider from Levin. A quick, short little ride that brought the weekend's tally up to just over 1,100km. I set the alarm on Friday night for 4am but in the end did the usual pre-ride trick of waking up before it went off. So I was up at 3:50 making a coffee and organising things. By 4:30 I was out the door and around at Brian's making sure he was up a nd at 'em then it was a short ride to Shell Pioneer to pick up Michelle & Al. We only just beat them there and as soon as Al had swallowed a pie we were off into a rather cold morning - grips on 75% and screen up. Had quite a nice little blast down to Shannon where we picked up Colin (without even stopping) and continued on south. A quick stop for piccys at the look out on the Paekakariki road and then on to the Hutt on damp and slippery roads. Gassed up, purchased me badge, yarned with a few others and soon it was time for John's wee briefing before we finally hit the road. Brian even won a hat in the prize draw. Also good to see Steve in his leathers all set for the ride. At about 7:15 the hordes departed and headed up the Rimatakas. Most people were very well behaved and were taking it quietly so Brian & I made our way through the pack until we caught up with some mates of Dad. We followed them through cold rain through to Masterton and then onto Mauriceville. I'd never been through here and it was quite a nice ride through pretty country - especially as the weather was now playing ball and the day was starting to turn into a right ripper. I passed Dad's mates heading through to Mangamire as I knew they were concerned about some of the turns in the Pohangina Valley so thought I'd lead them through it. Somewhere through here Al turned up as well and it was quite a procession heading over the track and onto Ashhurst. Turning off at Ashhurst to head up into the valley we lost Dad's mates and Al - stopping for gas I 'spose. So it was just Brian and I until Hitcher tucked in behind. 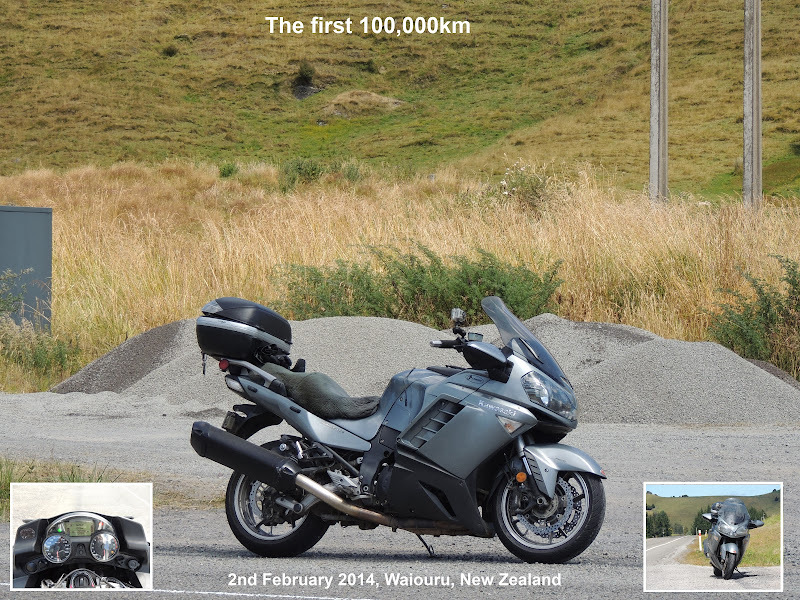 We had a great ride through the valley, onto Rangiwahia and then the main drag to Waiouru. Had a close one north of Mangaweka when a cop came around the corner and we were doing a reasonable pace - phew! Hitcher pulled off at Taihape for a feed and we kept on trucking to Waiouru. At Waiouru I opened my topbox to a disaster - my water bottle had exploded and all my gear was soaked in about 800mls of water. Wet weather gear, puncture repair kit, camera bag (note water on lens in piccy) and...the route instructions. I tipped the water out and put my jersey in the bottom to soak up the remainder. The camera still worked and went into my jacket pocket for the rest of the trip. Fuel and a feed and we were just getting ready to leave when Hitcher turned up, so it was 3 bikes again heading off towards Ohakune keeping our eyes peeled for the Fields Track turn-off. N o stopping at Tamarunui, we hit the Forgotten Highway and were soon into it's delicious corners and dodgy surfaces. Had a nice run through to Whangamomona where we stopped for a cold drink - all those corners and the wee bit of gravel made for thirsty work. We weren't the only one's there - bikers from all over had the same idea as us. After our drink we headed off into Stratford and stopped again in Eltham for our last fill up. Leaving Eltham we followed some notes I'd made the night before (the only one's as I had thought that I knew everywhere else we had to go - double-doh!) as we were to take in some back roads to bypass Hawera (good idea that). In the end we only had to do one quick U-turn and it was quite a nice ride through this new to us roads. By now we'd done over 800km for the day and were starting to feel it so we took it pretty easy through Wanganui, Marton & Halcombe before finally making it home at about 5:45pm. A pretty long day but a great ride all the same. And now for the news that really put a downer on the ride: sadly one of the riders had an off on the Forgotten Highway and passed away. I only heard of this this afternoon and it definitely wasn't nice to hear it - I had spoken to the rider earlier in the day and he had been fizzing in anticipation of a great ride. A terrible incident to marr a great day and my condolences to his partner & family. Well, not really, but a keen amateur. The slide show below shows Mark giving his Bandit a bit of TLC (oil & filter change) before next weekend's Capital 1000K Cruise. Yep, got taken out on the VTR on the way home from work. A guy who admitted to being in a hurry to get home failed to give way and clobbered me at slow speed (both of us) on the right hand side of the bike and over and off I went. No injuries to me except for a bang on the knee and a bit of a graze there but the poor wee Honda got a bit hammered. 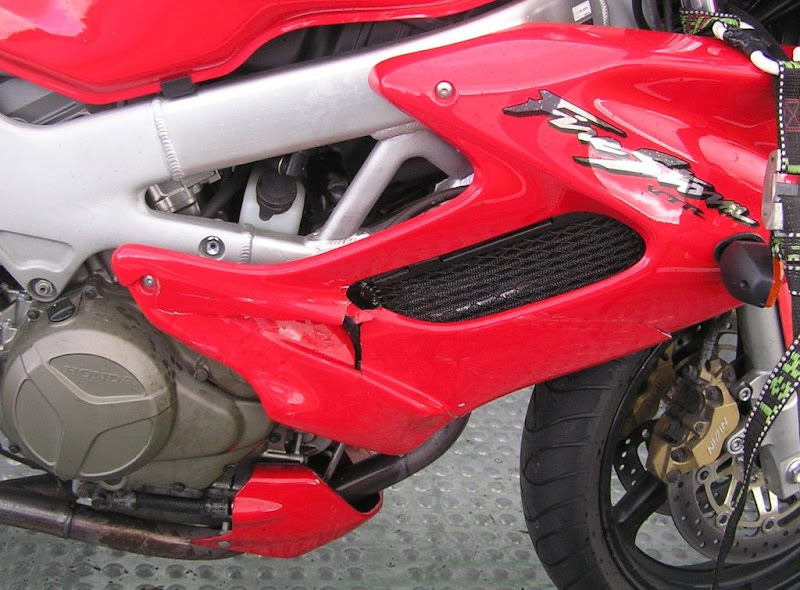 What I think is the worst of the damage is to the RHS radiator where the fairing was rammed into it. Coolant everywhere so I couldn't ride her home so Brian had to come and rescue me with his trailer. Otherwise, the fairing is pretty much toast on both sides, the screen is cracked, LHS indicator gone, a wee scratch on the LHS muffler (which has been pushed in closer to the center of the bike), clutch lever & mirror and that's about it. More soon when I hear from the insurance company/bike shop. The latest Rusty Trumpet (the Rusty Nuts newsletter) is up on their website here. It even includes a little more info on the 2010 10,000km in 10 days run. And there are some more GC write-ups here. I forgot to mention in my Friday night ride blog that I can now ride and listen to my ipod at the same time. I found some in-ear earphones lying around the place and decided to give them a go. The good thing about them is that they do block the wind noise and therefore the ipod does not have to be on very loud. They are also pretty comfortable if in properly - not sure about on a 1,000km day but maybe I'll give that a shot too. The only issue is getting them in properly and having them stay there. If they're in properly they tend to stay in but if not they can work their way loose - as the left one seemed to do. The only other thing is that you cannot hear a thing anyone says to you - unlike when wearing ear plugs. I'm also not sure what's better for your hearing: music on quietly or ear plugs??? Not the best weather for it but today Brian & I took the Hondas up to Napier & back for a quick visit with my folks. We left Palmy in okish weather but by the time we stopped for gas in Danniverke we'd hit our first patch of rain. Leaving Danniverke we headed out through Matamau, Makotu and Ormonville before taking the back road past Takapau and into Waipuk. Then we turned further East at Waipawa to take us to Patangeta (it absolutely bucketed down through here) and up Middle Road to Havelock North and finally Napier. After a nice hot lunch with the olds and a bit of mucking around with the bikes in the shed we suited up again for the ride home. After gassing up in Hastings we hit highway 50 and battled with the wind all the way back. More showers also added to the excitement. Not the best day for it but still a nice ride - be even better once we see some proper summer. Okay, fixed some wee computer issues and have got my ride write-up done. See it here. 2008 Grand Challenge is all over and I managed to get there in the end! The route was reasonably tough this year and took me to a few places where I'd never been and the weather certainly added another element to the challenge. Perhaps because of this of the 104 people who registered for the ride, 30 did not finish. This includes those that crashed out, broke down and pulled out due to weather or knowing that they would not have enough time to complete the run. One who did not finish due to a crash was a riding friend, Steve. Steve had a low speed fall on Route 52 north of Wimbledon. Luckily he got away with a broken collarbone and is now resting at home. It certainly was not nice coming around the corner and seeing him sitting on the side of the road with his bike over the bank. Get well Steve and I hope the 'busa is not in too bad condition. That's about all for now - I'll do a more detailed write-up for the website at some stage. Slightly better weather this week - well actually a lot better - no rain and not too much wind. Another good turnout too - nearly 30 bikes. The ride took us out Pohangina East road, through Apiti and back into Fielding. A great bit of road for having a play on but plenty of care required in places with metal on the road and the remains of small slip etc. A couple of wee stops allowed the group to reform we all road into Fielding together before stopping at a local watering hole for drinkees and the odd yarn. 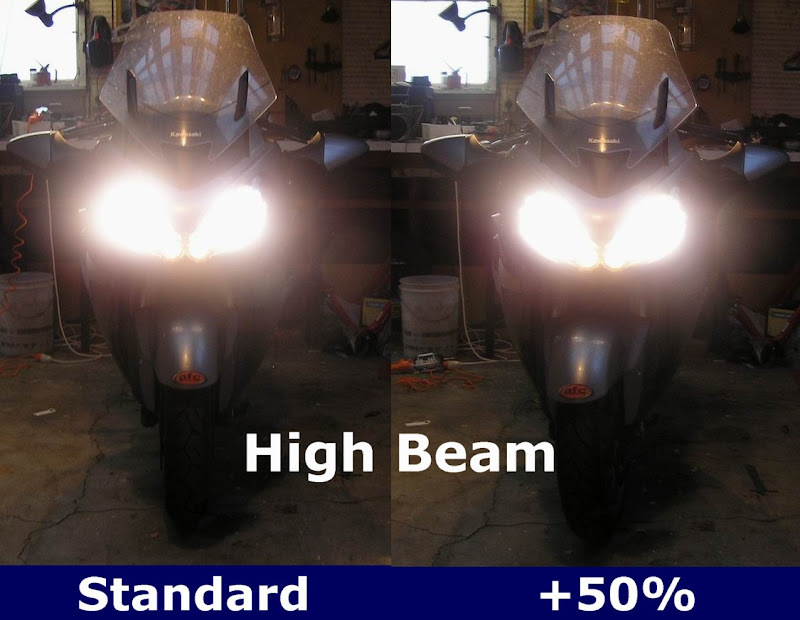 Nice ride and I was pleased to discover that the VTR's high beam is quite good (had my doubts due to it's size). 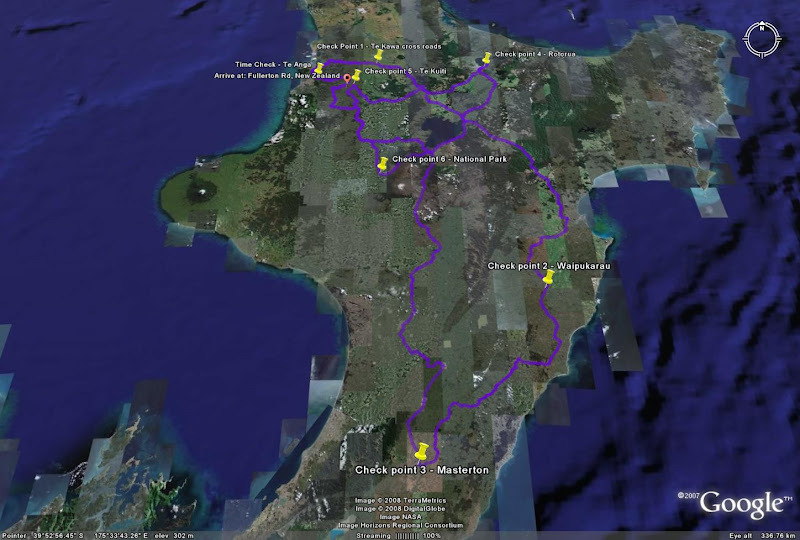 I'll miss next week's ride as I'll be sitting in Turangi resting up before the start of the GC - oh damn. After doing the 2007 800k's in a day Andrew had decided we needed to do the 2008 version as well. 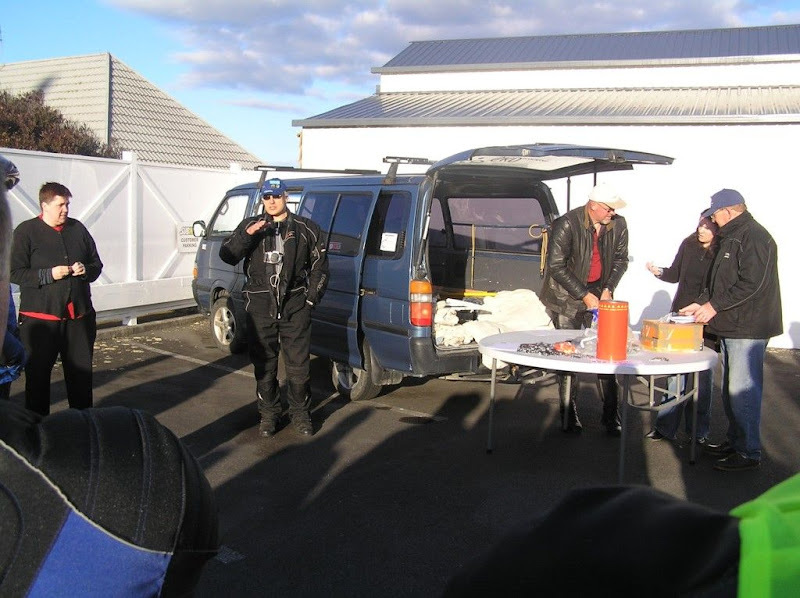 The club had run it earlier in the year, but with a poor turn out had decided to run it again this weeked. As it turned out Andrew got crook and couldn't make it so I was off on a solo expedition. The weather wasn't great with wind and rain forecast, but I had already decided I was going regardless. An early breaky and I was off, filled up the bike on the way into town, then headed around to Breakers for the sign in and kick off. When I got there about 4 other bikes were already there. I paid my money, they recorded my odo reading and as the other guys weren't showing much sign of leaving I decided head off. The first check point was Inglewood so it was off to the Naki I went, not the most exciting ride but easy K's to clock up early. A guy on a Harley that I had seen at Breakers passed me at Ohakea and instead of sticking with him I let him go and continued on alone. Somewhere between Wanganui and Waverley my morning cup of tea needed to get out so I had a quick pit stop to water the weeds. I'd left Palmy at 07:07 and was in Inglewood about 09:30 I got gas, had a quick drink then was off again. The weather had looked a bit damp ahead and I tossed up stopping to put the wet weather gear on but decided to continue until it got real wet. Once I got away from civilisation I upped the pace a bit and was soon attacking Mount Messenger, the road was wet so I had to take it a bit easy. After that it was the Awakino gorge and onto Te Kuiti. I had calculated this to be about half way so it was good to know I was on the down hill side. Heading through to Whakamaru and the second check point the roads were once again wet with the odd shower to stop me getting too hot. I pulled into Whakamaru at about 12:15, the guy on the Harley was just leaving, so he hadn't got away on me much. I had a drink and bite to eat and as I was leaving the next group pulled up. I had hoped to get all the way back to Palmy on a tank but was going to see how things went. Down the back of the lake I got to cover the ground at a good pace with the roads dry and the weather improving, then it was onto Mananui and the western side of the mountain and into the Paraparas. I enjoyed this bit and the road was in good condition considering all the rain over the winter. I was soon in Wanganui for the second time in a day. I decided to keep going and see how my petrol supply held up but it wasn't long before the gauge was flashing and I knew I would be pushing it to make it to Palmy so had a quick fill up at Bulls. I was back at Breakers at 16:08, nine hours and one minute after leaving with 810km in between. First one of the season and I was crook with a cold but went anyway. A really fantastic group of bikes (about 27 in all - couldn't get them all in the picture) all keen despite the average weather. Due to the windy conditions, the ride was cut short and we simply headed through the gorge, then back through Balance and over the track back into Palmy. It was quite windy through Balance and there was quite a bit of drizzle. I had issues with my visor fogging as I was wearing my old shoei which has no anti-fog insert fitted. Visibility got worse coming down the track as it was quite foggy - not a lot of fun. Well the Connie is in the shop getting a service prior to all the great summer's riding that's just on the horizon and they kindly loaned me this little number to get home on. It's a second hand bike with about 5,000km on it but has an aftermarket muffler which gives it a nice little growl and some trick carbon (or carbon-look) goodies. I've only pottered around town on it and it is definitely great for this - very small and narrow, great for getting into tight places. It also gets up and goes quite well. The riding position is a little weird - a slightly racy position for your legs and then low but wide handle bars. These wide handle bars and the total lack of weight (I'd just gotten off the Connie after all) make it a piece of cake to chuck around. The clutch is very light but the gear lever felt like it had quite a longish throw (stuffed up a couple of up-changes by being a bit gentle on it) but otherwise the little motor is quite nice. Didn't think much of the brakes as they needed a bit of squeeze - though once again I'm used to some pretty serious stoppers on the Connie and pretty reasonable brakes on the VTR. And these are just the longer rides! There's toy runs and Friday night rides etc as well to get through - yeehah! The Connie is going to be busy - in for a service this week to make sure she's all set for some exercise. All right, giggidy, giggity! Yep daylights savings is here and with it came a nice sunny day. Lots of things to do around the house yesterday and today but after washing the Connie prior to it's service this week it was time for a little ride in the sunshine. Not much a ride distance wise but I had a blast on the Honda over the saddle and then headed through to Balance. My first surprise came when I rounded a bend to find a caravan parked in the middle of the road. I managed to avoid it and then got my second surprise - the fuel light on the bike starting to flash. From here on I took it easy - I'm still unsure of the range of the Honda once the gauge starts flashing. I managed to make it back into Palmy ok and put 16L in the tank before heading back out to Linton to catch up with some friends for a bit before heading home to put the bike to bed. Yep, that's right no bike riding this weekend. Instead I was off to the Taranaki for my Nephew's 1st birthday and to let the dog frolic amongst the rabbits. Surprise, surprise though, a vintage bike rally was on and the bike's were filing straight past the gate. From a pretty poor vantage point I was able to quickly grab the below pics before heading back inside for the birthday party. Yep nice day again so no excuse not to get out and go for a ride. 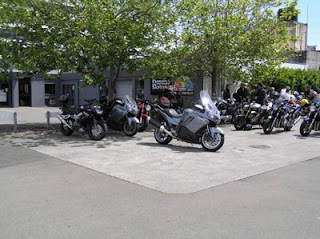 Met up with about a dozen Kiwi Bikers in town and then headed out through some of our delicious back roads. Good to give the Honda some exercise. Stopped off at the cafe by Balance bridge and then pottered home all the while managing to not get a ticket. Good stuff. The day of the pootle finally arrived and after getting up early I jumped on the bike and headed down to meet the rest of the guys at BP Rangitikei. Waiting there was my old man (SV), his mate Goldie (CB1300S) and Steve (Twosup, 'Busa). As we were missing a few bods and everyone other than me had already ridden nearly 200km we decided to abandon the full route and just see where the day took us. and then Marton via some back roads to Wanganui. The weather was ok through here although the roads were quite wet in places. Leaving Wanganui we hit the Paraparas and had a great ride through to National Park. The road was more often than dry and a great deal of care had to be taken as there were fresh slips to go along with the usual storm damage and stock. Quite chilly going through National Park too. to Tamarunui. We stopped here for an early lunch before heading back out of Tamarunui and up over Highway 41. Had a great ride over here as the weather had improved and the road was mostly dry. We turned off 41 onto 32 to head around the back of the lake. This is a great bit of road but we had a few drizzly patches and the roads were wet and slippery in places. After this I was separated from the rest of the guys and I only caught up to them when they became stuck in traffic. I quiet ride the rest of the way to Napier where we stopped in at the olds for a coffee before Steve and I headed back home via Highway 50. Not a great end to the ride but otherwise it was a good day out on the bike with about 720km clocked up in preparation for the Grand Challenge. to try out different horses and compare them to the might VTR! Dad only picked up his SV on Friday but was quite keen to take it for a run and meet me somewhere so I could have a little squirt. I got on the SV at Porangahau Beach and road it back up Route 52 to Waipuk. This is a primo ride with plenty of nice corners to throw a sportsbike at. Getting on the SV, I noticed that the ride position is pretty similar to that of the VTR - the bars may be a little bit lower and also feel a little wider. Seat comfort was a much of a muchness and weather protection was also similar - the standard screen of the SV was pretty good compared to the Givi one on the VTR. Riding off and naturally you know it is V-twin - the same lumpy sort of power delivery although the motor seems to smooth out a bit more than the VTR once there's some revs on. The fuel injection is very smooth and helps the quick response from engine even if in a high gear with not many revs on - to me this felt better than the VTR. Once steaming along the bike feels very relaxed just like the VTR and it is easy to speed - the standard pipes are a bit louder than the VTR's but definitely not noisy. As we were not riding hard and didn't try any top gear roll-on comparisons or anything it's hard to say which bike had more go (although the SV should win here), let's just say that the two twins offer similar performance and it's the kind that puts a big smile on the dial! It took me quite a while to get used to the steering damper - especially in slower corners. I haven't ridden a bike with one for a long time and you forget that you need to put in a bit more effort to get the bike through the corners. I also felt (again because I'm not used to a damper) that it damped out some of the "feel" from the front wheel. It was good however, in the bumpier corners where the VTR would have been a bit twitchier, the SV held it's line a bit better. Dad had been playing with his suspension settings (softening them up) and it was in these bumpier corners where the bike felt a little soft in the rear. The brakes were fine although I never had to use them hard. Looks: well, the SV has a more modern look to it and is nice in black but they're pretty similar in that they both have minimal fairing's so that the motor can go on show. The SV is perhaps the more aggressive looking and that probably fits as it is the "sportier" package of the two. Twins are fun! Being a nice fine Father's Day I thought it would be a good idea to go for a little potter and meet up with the old man so that I could check out his new bike properly. Chatting on the phone earlier in the morning we'd decided to meet in Waipukurau and then find some back roads. As the old man's new bike is an SV I had to take the Honda so that it could be a day out for the "twins". I left Palmy knowing that I was leaving earlier than Dad so I decided to take in some back roads rather than sticking to the boring old main road. First up was the Saddle and it is in good nick at the moment so it was a lot of fun heading up the hill until I got up into the mist. Luckily the mist wasn't that thick and I didn't have to ride by braille to get up to the lookout at the windmills. Quite neat seeing the windmills "stir" the fog. From here it was more back roads into Danniverke and then another turn off at Matamau took me out through Ormondville to Takapau and finally to Waipuk where the old man had just arrived when I got there. A quick top up with gas and coffee and we headed off on Route 52 to Porangahau - a great piece of road. At Porangahau we swapped bikes and pottered out to the beach before turning around and retracing our tracks to Waipuk - but this time trying out different steeds. Back in Waipuk we had some lunch and then headed South again. Dad turned off to Onga so he could enjoy Highway 50 back to Napier while I pottered across the plains. After a quick stop in Woodville I took the Balance turn-off and headed home via the Pahiatua track. Nice little Sunday ride - and I've now clocked up over 1,200km on the VTR. 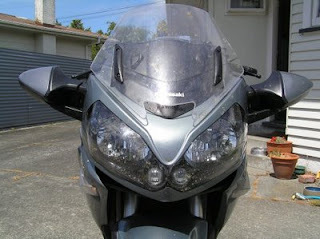 Came across a link to this petition on Kiwi Biker. Supposedly someone is trying to get the MotoGP to Taupo. Pretty optimistic but if it happens I'm there!